Sorry for the fussy photo. I wish I had taken a photo before the rows went together. This is a very very old UFO. One of my oldest UFOs. I did a row by row and a class with 3D trees way back in 1998. I also added the dogs maybe in 1999. Then I took another class on UFOs and dug out some of these rows and blocks and started to put them together. Well then it sat for 10 plus years. Every once in a while I dig it out. I once put it on my UFO list then forgot what project it was because the name was just old UFO. I could not find it at one time. While I took it to retreat last month and did some work on it. I wish I had taken a photo at the start of retreat. Well here is mid way. Here of some of the browns. A brown dog made years before Lex my brown dog came in to our lives. The brown Bear and bears paw blocks. The the sweet little brown log cabin blocks. I got this row together at retreat. Before retreat they were only blocks. At the end of retreat mostly in rows. It is almost square. I do not want square. I think I would like a few more rows of simple patchwork added in. Maybe two 6" rows like the snails trail but add them in above the tigers and under the Zebras. And not snails trail again but maybe geese or mountain blocks. Then it would be 12" taller then the width, say 62" by 74" with out boarders. I am sure I will add boarders. Maybe dark blue, brown? While my plan for Brown this month is to work on some of the needed rows. And they will have some Brown scraps, maybe some green and red and Blue. But Yes Brown Scraps! I have added this to the Linky party over at Soscrappy. 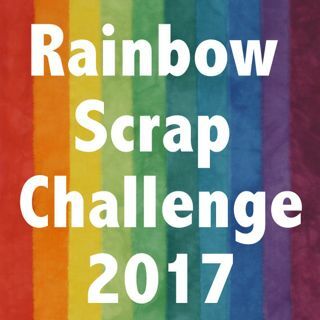 You can go see what other are doing for the Rainbow Scrap Challenge 2013. 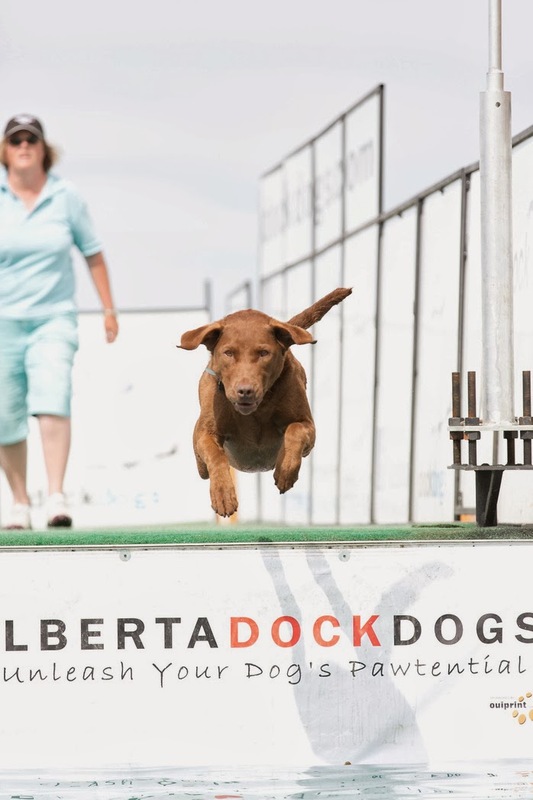 Ok if this month is brown, You will have to see some Brown Dog photos. I have lots. 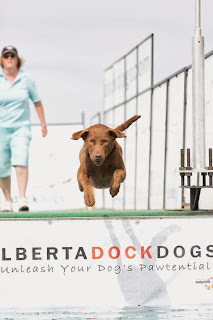 Lex and I at Dock Dogs this past August. Photo by Darcy Evans. I Love your Old UFO! How original and there's so much to look at. Glad you are finding a reason to polish off your oldest UFO. It is funny how projects get put away. It is impressive that you still know where you were headed with this one-- it has so many different blocks! 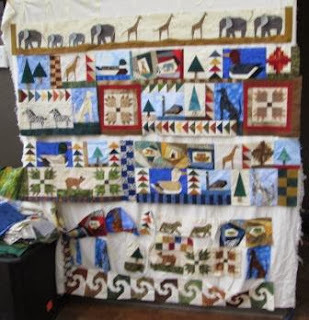 What a fun quilt - almost like an I Spy quilt with all the different animals and blocks. And of course, I love the bear and bear's paw & log cabins! Great picture of Lex, too! What a fun story tracking the history of this UFO! I know how that goes very well! 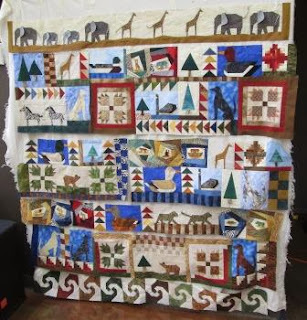 So glad this one is slowly moving towards being finished because it is a really amazing quilt! Love that "Old UFO" Cathy, And I marvel at how all stories come back to that beautiful Lex. Happy shoveling today. I think the idea of brown mountain squares is a fabulous idea for this quilt with all its nature themes. I think it would look great with a row of them at the top and at the bottom. That's quite the project! Like the cat, it keeps coming back! ;-) I'm thinking a row of friendship stars across the top would give the unity of the 'triangle' shape found in the existing geese blocks, and the 'swirly' nature of the snails' trail blocks without repeating anything...Whatever; it will be great fun when you finish it! 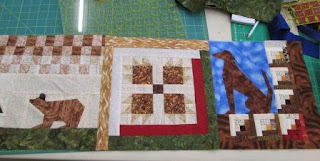 So many fun blocks in your UFO - it is going to make such a great quilt. I love your UFO! I think you are right on with some flying geese- maybe some more blocks of trees, bears and dogs could find their way in again.